A flight medic leans in to hear the words spoken by a Canadian soldier who has just lost his left foot to an IED strike in western Kandahar province. 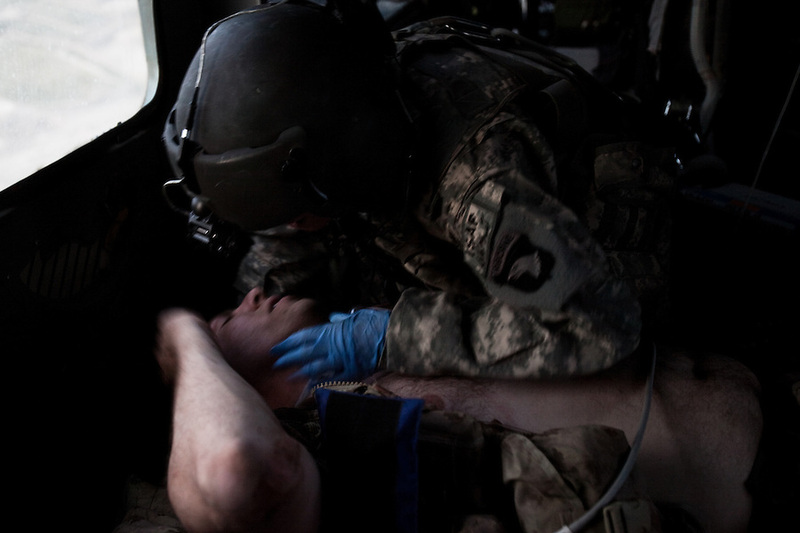 Scenes from the medical evacuations of wounded Americans, Canadians, and Afghan civilians and soldiers being flown by Charlie Co. 6th Battalion 101st Aviation Regiment of the 101st Airborne Division. Charlie Co. - which flies under the call-sign "Shadow Dustoff" - flies into rush the wounded to medical care out of bases scattered across Oruzgan, Kandahar, and Helmand Provinces in the Afghan south. These images were taken of missions flown out of Kandahar Airfield in Kandahar Province and Camp Dwyer in Helmand Province.